Lowry worked as rent collector for the Pall Mall Property Company, prefering to keep the work secret. Lowry did not want people to think of him as a part-time artist. The job led to Lowry walking all over the city providing L.S.Lowry with many sights and experiences. Children playing in the streets, people returning from work, going off to work, gossip on the front steps, incidents, market places and Whit - processions. But all this changed, the blitz and rebuilding, slum clearances and new housing, changed the face of the city Lowry had observed so well. "I saw the industrial scene and was affected by it. Trying to draw it all the time and trying to express the industrial scene as well as possible. It wasn't easy, well, a camera could have done the scene straight off". Lowry felt that drawings were as hard to do as paintings. Working the surface of the drawings by smudging, erasing and rubbing the pencil lines on the paper to build the atmosphere of the drawing. This artist would often make quick sketches on the spot on whatever paper he had in his pockets. 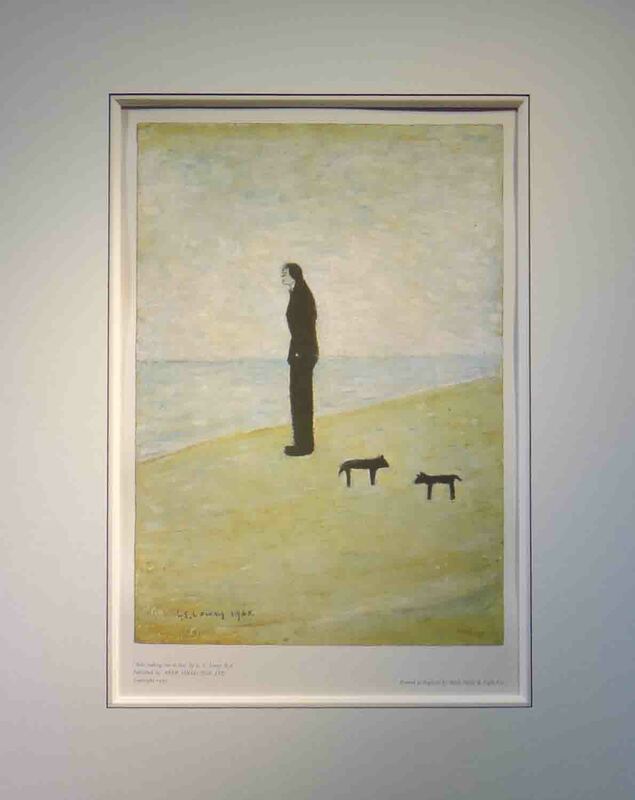 L.S.Lowry carefully composed his pictures in a painting room at home and took great care over placing each figure. Late in life he would sit before a canvas or board on his easel and not know what was going to be in the painting until he started working. He called them "dreamscapes". Bernard Taylor made the suggestion that helped Lowry achieve the stark figures and the pallor of the industrial sky that he desired. Taylor suggested Lowry painted on a pure white background. He experimented with layers of white paint on boards, leaving them for a time until the surface became creamy. LS Lowry used a very basic range of colours, which he mixed on his palette and painted on the white background. "I am a simple man, and use simple materials: ivory, black, vermilion (red), Prussian blue, yellow ochre, flake white and no medium (e.g. linseed oil). That's all I've ever used in my paintings. I like oils... I like a medium you can work into over a period of time". Looking closely at the surface of a Lowry painting shows us the variety of ways he worked the paint with brushes (using both ends), with his fingers and with sticks or a nail. Some paintings are painted over the suface of other images. The 1938 painting Head of a Man (Man with Red Eyes) when x-rayed showed a female portrait and possibly a self-portrait underneath. Someone once asked,"What do you do with your old suits?" "Wear them", came the reply! Lowry certainly wore them for work, wiping the brushes on his lapels and sleeves. In 1932 the father of Lowry died . For the next seven years, his 73 year old mother became 'bed fast' and completely ruled the life of Lowry. After she died in 1939, Lowry painted "The Bedroom Pendlebury" - in memory of those long hours he spent there. Demanding a great deal of his attention, Lowry would usually only manage to arrive at his studio after dark. "My mother did not understand my art, but she understood me and that was enough" Lowry said.